Coming together for their General Assembly were 22 Vocation Promoters from three regions in our country. The meeting took all of four days- from June 19-22 at the Priory House. Mother Adelaida Ygrubay, Prioress, opened the assembly held at the Caridad Barrion Hall. She reminded the vocation animators that basic to their role is a very close relationship with Jesus Christ and first and foremost in our concern is witnessing to him. This goes too for all the members of the various communities of sisters, who, she believes should have more sessions of sharing with one another. Revealing that she has never been a vocation promoter and does not know much about the job, she encouraged us to share experiences- our difficulties, problems, concerns, etc. And we did- almost all of us. That took almost the entire morning. Sr. Mary Paul touching on her work experience as Priory Coordinator of Vocation Promotions, shared with us some activities, strategies and tips, giving us handouts written by Fr. Robert Reyes, Fr. Jose Quilong, SJ, and Fr. Thomas Green, among others. We learned how to promote vocations through sessions and activities, like Life Direction, Tour-in, Pray-in, Vocation Seminar, Break-in, Search-in, and Discernment Retreat. And we made a Vocation Time Frame with our group mates. The toughest work for all of us in the groups was preparing the modules for Life Direction sessions. These are: Module I: The god who loves, Module II: The God who Calls, Module III: The God who Calls us to Self-knowledge, and Module IV: The Generous God. Each group presented its work on Powerpoint, answered questions, listened to critique and noted suggestions and improvements. The groups also planned the activities for their region Luzon, Visayas and Mindanao. 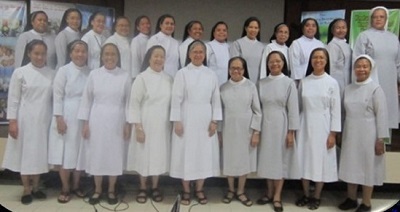 Sr. Pauline Trivino, one of the members of the committee on the Scholarship for Christian Formation of Young Women mandated by the 20th Manila Priory Chapter, gave an update of their schema of their Plan of Action, to establish a program of scholarship and formation in Christian life to be offered to high school graduates interested to join the Priory. The last day was devoted to prayer and Fasting during which we skipped snacks, had only “lugaw” for lunch and earnestly prayed during common and chain adoration. In-between was Sr. Lydia’s talk once again encouraging each one towards self-conversion and closer bonding with Christ and with one another. The assembly ended with the send-off ceremonies and giving of medals for us and materials for vocation promotion.